Innovating newer and advanced methodologies, we lead the market in manufacturing and supplying mobile signal jammer around the globe. Our product is manufactured using first-grade raw materials ensuring its strength purchased from genuine vendors. It is used for blocking the mobile signals within 50 meters circumference. Moreover this is manufactured using advanced machineries, so that they are highly durable. 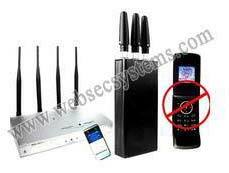 all types of mobile band like iden, cdma, gsm, dcs, phs, pcs, wcdma etc.